What Day Of The Week Is October 19? 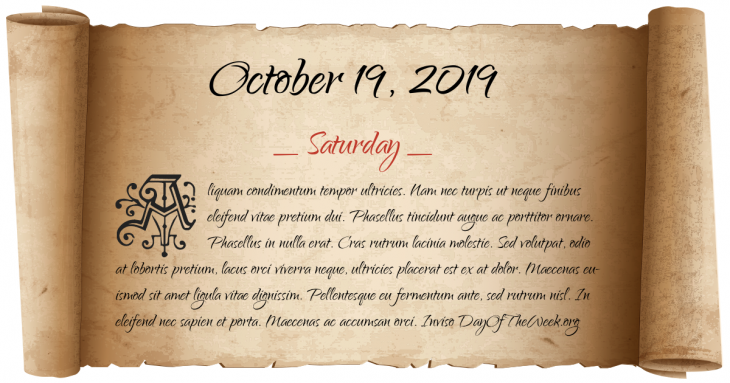 October 19, 2019 is the 292nd day of the year 2019 in the Gregorian calendar. There are 73 days remaining until the end of the year. The day of the week is Saturday. Second Punic War: At the Battle of Zama, Roman legions under Scipio Africanus defeat Hannibal Barca, leader of the army defending Carthage. King John of England dies at Newark-on-Trent and is succeeded by his nine-year-old son Henry. The Universität Heidelberg held its first lecture, making it the oldest German university. The Thirteen Years War ends with the Second Treaty of Thorn. The First Battle of Ypres begins. The People’s Liberation Army takes control of the town of Qamdo; this is sometimes called the “Invasion of Tibet”. President Richard Nixon rejects an Appeals Court decision that he turn over the Watergate tapes. SIEV-X, an Indonesian fishing boat en-route to Christmas Island, carrying over 400 asylum seekers, sinks in international waters with the loss of 353 people. Who were born on October 19?